I'm a big fan of http://www.notonthehighstreet.com/ - I have been for years and most of the presents I buy for family or friends are from this website. For anyone that doesn't know - the website is a place to buy unique, rare, odd, cool gifts that you wouldn't normally find on in High Street stores. Mostly all of the businesses are small and so the point of the website (and why it was started) was so that its easier for us (the shopper) to browse lots of small businesses and search products rather than having to visit 500 small websites individually - it's a great idea and saves so much time and hassle. 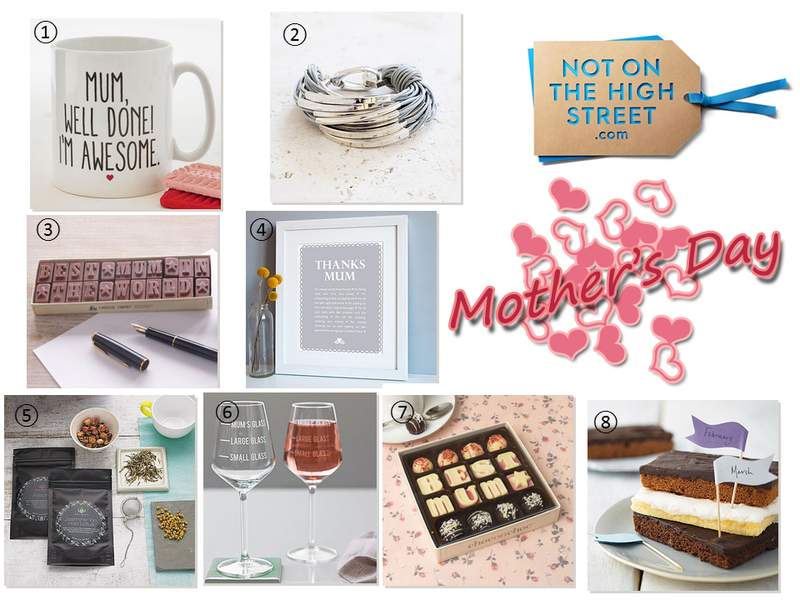 For Mother's Day I decided to put together a few gifts I would consider buying my Mum. My mum has a big mug cupboard so I know she'd love another mug (actually she'd probably kill me if I bought her anymore) but this one with the funny quote on the side would be a great addition. Jewellery - the last time I bought my mum a bracelet she told me off for spending so much on her. This bracelet is relatively cheap and looks great. My mum is more a gold jewellery fan than silver but still looks lovely. Who doesn't loves the odd bit of chocolate now and then and you can customise this with the words you want. I really like these present ideas - where you can personalise it with your own 'history' - with this particular present you can add in why you want to 'thank' your mum. My mum is a big tea drinker - so this present is a great idea. Each month you get different tea to try. A bit of a comical present (as I think it insinuates) that you're calling your mum an alcoholic (maybe not) - she'd probably still find it funny! I bought this present for my mum either 2 years ago or last year (my memory is getting worse - old age?!) and she really liked it. You get the words 'best mum' and some truffles in a lovely box. Similar to the tea subscription - you can sign your mum up to join the 'cake slice club' which means you get a slice of cake each month to try. Have any of you ever tried www.notonthehighstreet.com for presents before? If so, what did you think? Let me know in the comments below. If you want to look at anymore of the Mother's Day range then you can click HERE.